Shopping for something else entirely in the food section of Geneva’s swanky Globus department store, this girly box of champagne truffles caught my eye. The pink box is a delight, and is sealed with two clear stickers embellished with golden crowns. 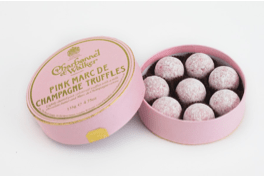 The six fat truffles inside have a scent of light champagne, with a breath of vanilla. Heavenly. The chocolate covering seems to be a pink-tinted white chocolate, the filling is milk chocoalte and sweet. And yes, they taste of champagne, sans the bubbles, of course. Are they the best truffles I’ve ever had? Hm, maybe not quite. But lovely for a post-breakfast, pre-lunch Sunday treat. And they go nicely with a glass of the real bubbly. I was thinking about this kicky song here when I woke up this morning – a French/Japanese acid jazz tune from about 20 years ago, a bit of dance, a bit of jazz, a bit of social activism. Very ‘Early 1990s’. My friend Daniela Norris asked me to participate in a writer’s game of tag, The Next Big Thing. A promise is a promise – but I will be posting my answers to TNBT questions over on Twitter (@paula_read) if you care to take a look. Thanks to Daniela for tagging me, and I encourage a visit to her blog.